As I think more about my rookie professional triathlon season, I find it to be more inspiring to look outside my world of swim, bike, run. With the 2018 Winter Olympics going on, there are so many amazing events and athletes that I've been drawn to. The athletes' stories, their upbringing, their talent, and even the rules of sports I'm not familiar with ignite a curiosity in me that the next aero helmet just can't. However, I can't help but draw some parallels and glean lessons from my countless hours in front of the TV - whether I'm on the trainer while watching or on the couch trying to stay awake for the next event. Biathletes need to nail their transitions too! It's no surprise they ease into transition, remove their gloves, and lower their heart rate in order to do their best shooting. While triathletes are not picking up rifles, imagine how easy we could clip into our pedals with a lower heart rate and increased composure. Chloe was tweeting about churros and ice cream in between runs during the qualifying rounds of the women's half pipe. I'm not condoning tweeting in transition, but if we were all as chill as Chloe Kim during competition, I think we'd be less likely to get our chamois in a twist. If there's one thing speed skating taught me, it's that drafting is freaking scary and that aero is everything. Research has been done to perfect the flat backed, aero position of speed skaters (just like a tri bike fits!) There has even been research on what color is the fastest (spoiler alert: it's all mental). Just watching the athletes ski moguls made my knees hurt. I don't think triathletes can learn anything here, other than to be grateful for any road paved in the last 10 years. Imagine if people could check you from the front or side every time you had possession of the puck, or in this case, your bike. It would, well, actually, it would be a lot like the men's swim start. Adam reminds all of us to celebrate the victories! Adam did not just win gold when he shimmied after this performance, but he celebrated that he nailed his routine and skated his heart out. This pose isn't far off from the typical hands up finish line pose - might try to add a few shimmies to my next finish! 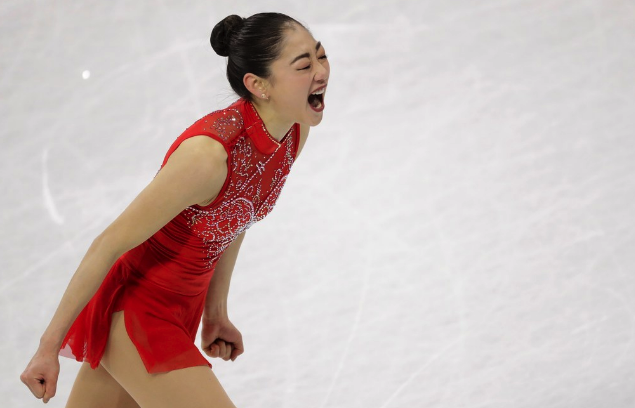 Similarly, Mirai Nagasu was not shy about her excitement when she became the first American woman (and third woman ever) to land a triple axel at the Olympics. More than anything else I've learned from these two is that nothing comes easy in sports. Adam and Mirai were consoling each other with hugs and In-and-Out burgers four years ago, when they both missed out on making the Olympic team. They had to wait four years for the next Olympics. Sure, there were competitions in the meantime, but none with the same exposure as the Olympics. At least we have Kona, 70.3 Worlds, and the NYC Triathlon ;) every year. Smooth surfaces are faster. Who wants to bike in front of me with a broom at my next triathlon? Look for tangents or lose precious seconds. This goes for swimming and running, not the bike! Transitions matter. And they feel just as "are these legs mine?!" for skiiers too. There are a few days left of the Olympics, with closing ceremonies on February 25th. With 102 events across 15 sports, I missed quite a few - what are your biggest take-aways from the Winter Games?